Size of Male: 37-51 lbs., 17-21 in. Size of Female: 37-51 lbs., 17-21 in. The Nova Scotia Duck Tolling Retriever, or “Toller,” is the smallest of the retrievers. These attractive medium-sized dogs are intelligent and very devoted to their families. They are in the “easy” dog training category and they love being with people. Tollers make great family dogs and they love children. As with most retrievers, they can excel at dog sports such as obedience, agility and anything where they need to retrieve, such as flyball and frisbee. They’re also great at water sports. The Toller has a rather unique history. They were probably bred from red decoy dogs brought to Canada from Great Britain with early settlers. These dogs may have been crossed with other retrievers, collies and spaniels. Hunters wanted to create a dog to “toll” or lure ducks to the shore the same way that foxes do. The foxes would play and cavort on the short to lure ducks in. The hunters bred the Toller to do the same thing. When the ducks came close to see what the dogs were doing the hunters could shoot them. Then the dogs could retrieve them from the water. This dog breed was originally called the Little River Duck Dog and then the Yarmouth Toller, but they are now known as the Nova Scotia Duck Tolling Retriever. The Toller is a very intelligent, outgoing, friendly dog. They are affectionate and loving with their family and they are especially good with children. Like most retrievers, they are easy to train and they have a strong desire to please. They are not quite as friendly toward strangers as the Golden Retriever or the Labrador so they do need some socialization when they are young. The Toller is a very hardworking dog and they enjoy being with their owner. They are very playful dogs, which is part of their working ability. They get along very well with other pets. Like most sporting dogs they will bark to give an alert but that is usually all they will do. 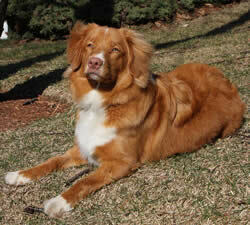 Living Environment – The Toller loves to be with people and they do not do well as kennel dogs. They can adapt to living in an apartment if you are dedicated to making sure they get plenty of daily exercise. However, most Tollers do best if they at least have a yard to play in. Grooming – The Nova Scotia Duck Tolling Retriever has a water-resistant double coat. They should not be bathed too often since it will remove the natural oils from their coat. You do need to brush your Toller regularly. They are average shedders. Diet & Exercise – The Toller has normal dietary requirements. However, they are very active dogs and they do need regular daily exercise. If they don’t get enough exercise they can become destructive in the home, like any dog. Tollers especially love water exercise such as swimming and water retrieving. Health – Tollers are a generally healthy, hardy breed but they can be subject to a few health problems such as canine hip dysplasia, Addison’s Disease and progressive retinal atrophy. You should always talk to a breeder about possible health problems before getting a puppy. The Nova Scotia Duck Tolling Retriever is a very intelligent breed and dog training is usually easy. Like all retrievers they have a strong desire to please their owner. As with most other sporting dogs they can tend to have a “soft” temperament so it’s best not to use harsh training methods. Use positive dog training methods (praise, rewards) instead.